ASUS on Wednesday announced a pair of tablets designed to combine its renowned hardware with Microsoft’s upcoming Windows 8 experience. If ASUS can manage to replicate the beautiful slates it put out running Android, I’d be comfortable in saying these will be ones to watch out for in the coming months. Surface should be shaking in its boots. First up is the ASUS Vivo Tab, a professional device equipped 11.6-inch Super IPS+ tech, Intel’s next-gen Atom processor, 2GB RAM, support for 1024-level Wacom digitizer and 64GB eMMC of internal storage. That’s room aplenty for documents, photos and videos. In addition, and almost a standard from ASUS, the Vivo Tab can transform into a full-on ultrabook through a mobile dock — complete with QWERTY keyboard, trackpad, two USB ports and secondary battery. Other specs include an 8-megapixel rear camera (2-megapixel cam) and built-in NFC sensor. ASUS also has a Vivo Tab RT in the pipeline rife with Tegra 3 quad-core processor, 2GB RAM, 32GB eMMC internal storage and 10.1-inch Super IPS+ display. The RT version of ASUS’s Vivo line also supports the company’s popular transforming ability, meaning you can tote the Tab RT around like an ultrabook. 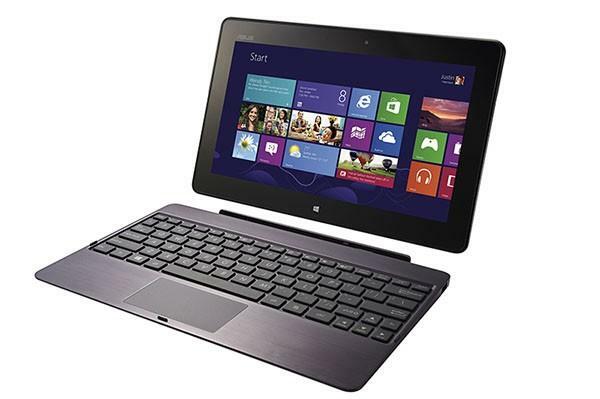 Two new tablets with a dual-purpose design that combines a high-resolution multi-touch display and a detachable QWERTY keyboard dock for a great Windows 8 experience. With a name taken from the Latin verb 「to live」, Vivo is designed as a constant companion that blends the familiar elegance of ASUS tablet design with Microsoft Corp.』s new touch-enabled Windows 8 operating system. The 11.6」 display with a 1366 x 768 resolution uses Super IPS+ technology to deliver superior visual clarity both indoors and out, and its 10-point multi-touch is complemented by Wacom digitiser stylus technology for high-precision stylus input and a more natural writing experience.